I decided I wanted to try growing strawberries in my garden this year. My mom didn't have much luck with hers last year, but I've been bound and determined to make mine work. So, I was really excited when I went out the other day and saw 4 berries already growing on my plants. Then, my heart broke the next day when I realized some woodland creature gobbled them all up! My fault for not putting the fencing up in time. Lesson learned. Thankfully, summertime brings fresh berries and fresh berry deals at our local markets. I just stocked up on 5 pounds of strawberries, and thought I'd try making a strawberry pie this week. With all the summer bbq's going on over the next few months, I think this Fresh Strawberry Pie with Honey Whipped Cream from Golden Blossom Honey would be an awesome addition to any bbq gathering! I love that this pie is sweetened with just honey and lemon juice- not sugar! It's a delicious summertime treat! What's your favorite summertime pie? You have woodland creatures lurking around? Yep! Raccoons, possums, bunnies. We get quite a few visitors in our yard. I don't have a raspberry bush, but really want a mulberry bush! We end up swiping them from the neighbors each summer. OMG, those are all the sweetest animals! You have the best wild pets! I do adore mulberry... it cannot be bought here anywhere, but Vojvodina used to covered in mullberries before WW2 because we produced silk warm. It's a very sensitive plant and all of them can die like in one season from a disease. That is exactly why we can't have a garden, either. We live by the woods and have more woodland creatures than I care to think about. Thank god for the farmer's market! I know! If it weren't for the farmers market we would never have fresh berries! Everytime I come here I see these gorgeous sweets and I drool 😅😅 I wish I stay next door so I can enjoy a slice or two. Another great recipe to share! I wish you did too, Rina! Then we could swap yummy treats all the time! Oh my...this looks amazing!! We are obsessed with strawberries right now since they're in season. You always make me drool with your recipes! I rarely have pie and I'm not sure why. They seem so easy to make. I'd say my favorite pie of all seasons is chocolate. It can't get any better than that! I make an open faced pie much like yours, only it's with June berries, since we have so many. I love your whipped cream top/sides. OMG that's so cute. I may have to copy that with my next pie. This looks very awesome. I like using honey over other sweeteners, but only REAL honey. That looks beyond yummy, I am a big fan of strawberries too! I Would devour this pie in no time, one slice would not be enough. I really need to make some of this. I had some fresh strawberries recently and I have a taste for strawberry desserts now! I love strawberry pie! I must try and make this, it looks soooo good! Honey whipped topping? Oh gosh, this may be my new favorite thing. Your pie looks fantastic. I need to try making the strawberries like this. I can't do the crust or the whipped cream... but I can do strawberries. I will take two, please. ;) This just looks so good and just so perfect for a summer party. 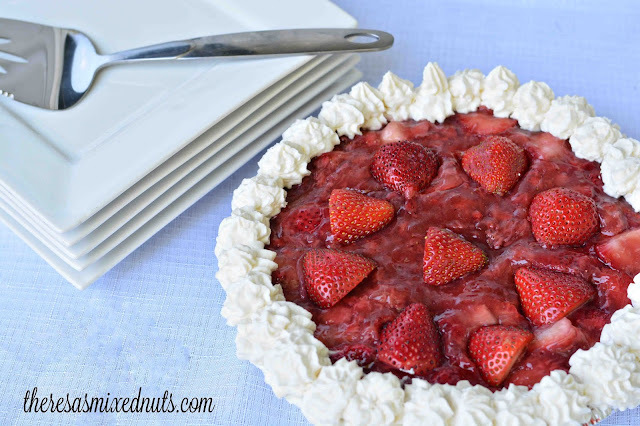 Strawberry pie is one of my favorites. That looks amazing! Strawberry is one of my favorite things to eat! My husband would love this pie. It sure looks tasty and strawberries are his favorite. This looks so delicious. I have never tried honey whip cream before. I will have to try this on the weekend. I am sure my family will love it. I want someeee...looks so fresh and yummy for sure. And using honey is much better than sugar.. 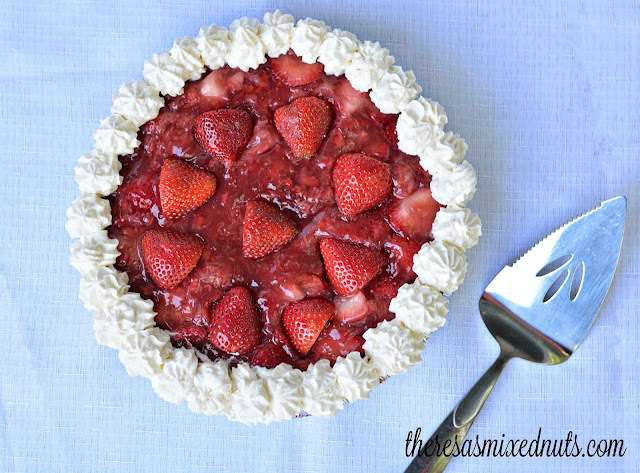 This strawberry pie has my mouth watering just from the images. I love the idea of substituting sugar with honey. Wow, this looks delicious. I will eat anything with strawberries in it and this looks right up my alley. Looks very delicious and healthy. Both honey and strawberry are my most favorite. It sounds so yummy when its comes together as a recipe. Will definitely have to try this and I am sure my kids are going to love it.